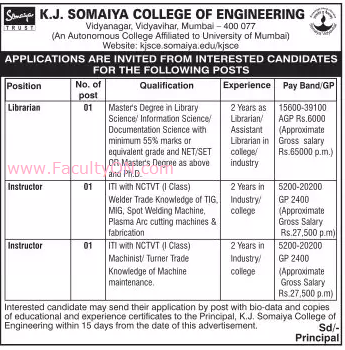 K.J.Somaiya College of Engineering, Mumbai has advertised in LOKSATTA newspaper for recruitment of Librarian / Instructor jobs vacancies. Interested and eligible job aspirants are requested to apply within 15 days from 11th October 2018. Check out further more details below. About College: In pursuit of commitment towards Quality in Technical Education, KJSCE had its first accreditation by the National Board of Accreditation (NBA), New Delhi way back in 1998 which subsequently was then reaccredited a couple of more times. During the last accreditation held in 2013, all the 5 UG programmes were provisionally accredited for 2 years (upto 2015). The College has now applied for accreditation by the National Assessment & Accreditation Council (NAAC) and is awaiting their visit. Instructor- ITI with NCTVT (I Class) Welder Trade Knowledge of TIG, MIG, Spot Welding Machine, Plasma Arc Cutting Machines & Fabrication. 2 years experience in Industry / College is required. Instructor- ITI with NCTVT (I Class) Machinist / Turner Trade Knowledge of Machine Maintenance. 2 years experience in Industry / College is required. How to Apply: Interested and Eligible candidates may send their resume giving full details along with recent colour passport size photograph and copies of educational / experience certificates to THE PRINCIPAL of the college address provided below by Post within 15 days.